When I first noticed the Barefoot Books World Atlas I was immediately intrigued, as Bookworm1 (age 5) is very interested in maps and loves staring at them and figuring out where various things are. (Most importantly, he likes to know where certain animals live.) Barefoot Books has done a nice job creating a large, colorful and informative atlas designed specifically for ages 8 and up, but which is suitable for younger ones as well. Barefoot Books World Atlas opens up with "The Story of Our Planet" which shares the history from an evolutionist point of view. As a Creationist, I disagree but do not find this to be distracting to the usefulness the rest of this book provides.) The second page spread shares "The Story of Map-Making" and after that we take a look at different parts of the planet. We begin with oceans, specifically the Pacific, and there are little icons of things like giant squids, killer whales, the Easter Island statues. There is also a fold-out flap which contains an illustration of the marine food chain. Throughout the book you will find lift-the-flap options which enable you to learn interesting facts about anything from the Vikings of Norway, to Indonesia's 130+ active volcanoes, to Kestrals. Each page spread also focuses on a particular continent or area with icons of people, animals native to the land, natural resources, and well-known land marks. The colors, as I mentioned, are bright and cheerful and my sons (even the three year old!) have enjoyed looking at this. Furthermore, Barefoot Books has offered a World Atlas iPad application in conjunction with the book. 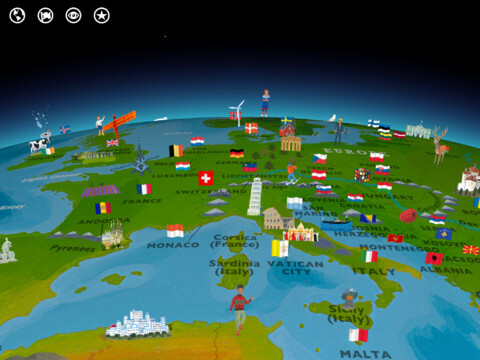 The iPad app follows the same vein as the hardback book - it displays a map of the world with icons. The fun thing about the iPad app (yes, it is fun!) is that you can double-tap the icons in order to learn more about any particular person, place or thing. There are real-life photographs to show the children what the objects really look like. There are also audio explanations for each item and videos on occasion. The two oldest bookworms and I spent some time investigating the globe together via this app. We rotated taking turns exploring things around the world. (First Bookworm1 would take a turn picking an icon, then Bookworm2 and so on and so forth.) I asked them their opinion of the "game" and they said that they both enjoyed it. In honor of the Olympics, Barefoot Books also has a generally offered to give away ONE World Atlas book and ONE iPad app to one of my readers here at Reading to Know. Would you care to win? Simply leave a comment below. For grins, let me know which country you intend to root for (aside from the good ol' U S of A, of course!). THIS CONTEST IS NOW CLOSED. THE WINNER, as selected by Random.or, IS #3 - Sherry at Semicolon!! Congrats! This contest is open to U.S. Residents only and will be open through July 31st. Thanks to Barefoot Books for their ideas for enjoying the Olympics with children and for offering a copy of their World Atlas and access to their iPad app to my family in exchange for our honest opinion. Thanks also for offering a giveaway to another of my readers! This is wonderfully generous and I'm excited to be presenting this opportunity. And that's the plain truth! Sign me up! Looks great! As a complete non-athlete, I'm sorry to admit that actually cheering for someone other than a U.S. team member has never crossed my mind. Hmmm. I'll have to think about that. We can't WAIT for the Olympics next week and I'm hoping to plot out a few ideas for us this week. How exciting! My husband just gave his iPad over to me for educational use only! We still love old fashion books this. We LoVED watching the Winter Olympics! I can't wait to watch the Summer games with the kids. We spent a lot of time in the Olympic room at the Atlanta history center in GA. I cab't wait for the connection to spark. My kids say we will cheer for Ireland since their great-grandparents were born there. No iPad here, but we have an iTouch. :) With the Olympics coming (and already watching a bit) we've determined we need an atlas and a globe in our home! Would love to get this book for my classroom & use the app for the I-pad. I'm working on adding to the nonfiction books in our classroom. Thanks for sharing. This looks like a wonderful geography resource. I have to admit we are also non-athletes so will be cheering for anyone from the US. It wasn't until last week that I realized the Olympics are around the corner. How sad is that?! I do enjoy watching random events, though. Other than the U.S., I guess I cheer a little for Australia. Ooh, I love geography. My parents had two cool books put out by Nat. Geo. that I enjoyed looking at as a kid: one was all about the U.S., and the other about the world. I'm looking forward to the Olympics. Since I lived in France for a brief time, I enjoy watching their athletes, and I'll also cheer for Romania because of some connections we have there. How relevant! Just the atlas though bc no i products here. After the USA, I'd love Mexico to win medals. Forgot to mention my email- thanks! I can identify with Bookworm1's fascination. I remember endlessly spinning a globe and putting down my finger to stop it. I determined that I would live wherever my finger landed and dutifully (joyfully) went off to find my animal atlas to see what animals lived in that particular area. I was, unsurprisingly, an indiscriminate traveler and world-animal lover--which meant that wherever my finger landed, I was quite pleased with what I found.